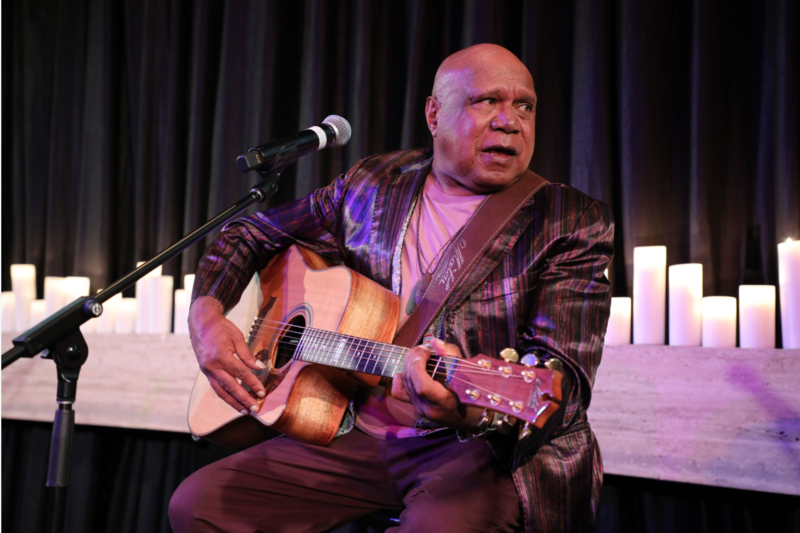 As the stories and music of Archie Roach flowed from the stage at yesterday’s Music In The House event, the room rocked between mesmerised silence to uproarious applause and standing ovations as we celebrated one of Australia’s greatest musician, leader and activist. Roach’s story is well-documented. A member of the Stolen Generations, his song ‘Took The Children Away’ from his 1990 debut album Charcoal Lane brought widespread attention to ‘the greatest cover-up in Australian history’, drawing attention to the hardship suffered by generations of Indigenous Australians. Making his way through the foster system following his time on the Rumbalara mission, Archie found himself on the streets, penniless and carrying only a guitar as he attempted to make sense of his upbringing and find his natural family. Years spent battling alcoholism and homelessness were brightened by the discovery of his life-long partner, Ruby Hunter, who sadly passed away in 2010. Their home was a refuge for Aboriginal teenagers living on the streets. After forming a band with Hunter, his work with Paul Kelly began what has been a long and prosperous career, defined not only by his massive contribution to music, but his tireless charitable work as a voice for First Nations’ people. In the words of many of his friends, he carries the collective trauma and loss of his people on his shoulders – a responsibility which he bears with strength and humility, and one which we witnessed yesterday during his raw and honest performance of ‘Took The Children Away’. This is a man who, only a few years ago, lost mobility on his right side following a stroke, and had to re-learn how to play music once more. Shortly after he was diagnosed with lung cancer and had half of his left lung removed. Listening to Rhoda Roberts tell Roach’s story, the audience of industry figures were utterly silent as they learned of his incredible strength and fortitude in the face of extreme adversity. Yet, as Archie himself took to the stage to accept Support Act’s Award for Excellence in the Community, he walked with strength, resplendent in a shimmering purple suit, and addressed the gathering with his ever-present humility. While much of the afternoon was a celebration of his life and work – with performances of songs such as Old Mission Road and Walking Into Doors among others from Paul Kelly with Linda and Vika Bull, Emma Donovan, David Leha, and Tiddas – the event was dually centric on fundraising for Support Act. With delicious food and the wine flowing freely, as we loosened throughout the luncheon so did our wallets. Support Act works tirelessly supporting the mental health of the music industry through financial relief, counselling, and soon, the first-ever music-specific support line, yesterday’s fundraiser backed the instalment of an office in Melbourne to increase access for music workers in the area. Joanna Cave, who will this year step down as Support Act’s CEO – a role which will be filled by former Go-Betweens manager and radio host Clive Miller – shared with us stories of the charity’s work and the difference made in the lives of so many music workers in crisis. An online silent auction took place alongside a bidding war over items such as an exclusive Jimmy Barnes package, a Missy Higgins birthday message, Reg Mombassa artwork, a year’s supply of Levi’s and more. A flying start to the fundraising efforts was given thanks to Michael Gudinski and Frontier Touring’s $50,000 donation, with the total achieved by the end of the day clocking around $200,000.